Fotios SA & Cheal C, Validating the white light illuminance trade-off permitted in pedestrian lighting, Local authority Lighting 2005, The Royal Institution of Great Britain, London, 8th December 2005, ILE/Surveyor 2005. This project investigated the effect of light source SPD on perception and visual performance in subsidiary streets. It was been found that consideration of light source SPD may enable lighting in subsidiary streets to adopt a reduced illuminance and that this trade-off may enable reductions in energy consumption. 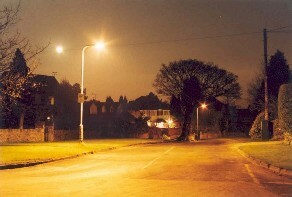 In the UK, the design illuminance for lighting in subsidiary (residential) streets is specified through two documents. BS EN 13201-2:2003 describes the minimum average horizontal illuminance for six lighting classes, the S-series. BS5489-1:2003 identifies how to select a lighting class according to crime rate and traffic flow, and furthermore permits a reduction of one S-class (a reduced illuminance) if lamps of General Colour Rendering Index (CRI) Ra ≥60 are used. This trade-off between CRI and illuminance promotes the installation of lamps of whiter appearance such as Metal Halide (MH). These have a higher CRI than high pressure sodium (HPS) lamps although generally a lower luminous efficacy - the illuminance reduction offsets the lower efficacy and hence offsets an increase in overall energy consumption. Steve Fotios and Chris Cheal have investigated whether the trade-off is supported by research evidence. An initial review of previous studies determined that brightness and foveal visual performance are important considerations for pedestrians, and that further evidence is required to confirm the effects of spectral power distribution (SPD). New experimental work has been carried out using five light sources (two types of MH, HPS, compact fluorescent and low pressure sodium) and three illuminances (2.0, 7.5 and 15.0 lux, the bottom, middle and top of the S-series). Brightness was assessed using three different techniques - side-by-side matching, side-by-side ranking, and semantic rating. At equal illuminance MH lamps are brighter than HPS; equal brightness is found at a mean illuminance ratio (MH/HPS) of approximately 0,72. These results support the trade-off between CRI and illuminance for mixed adaptation and short-term adaptation. Foveal visual performance was assessed using Landolt-ring tasks. It was found that achromatic visual acuity and contrast detection are affected by luminance, with visual performance decreasing as luminance decreases, but are not affected by lamp SPD. This suggests that if the CRI vs. illuminance trade-off is adopted there will be a reduction in visual performance under MH lighting at the lower illuminance. Two tests involving chromatic information were carried out – acuity of coloured Landolt rings and colour naming accuracy; these results demonstrate that lamp SPD does affect some elements of visual performance. The experimental results were extrapolated to predict the effect of lighting conditions on three key visual tasks for pedestrians. It was determined that using MH lighting instead of HPS lighting, at an illuminance reduced one class of the S-series, will not significantly affect visual orientation or facial recognition, but that further work is needed to determine the effect on obstacle detection. Further work is now being developed to confirm these findings. Field studies of brightness are taking advantage of current PFI work. In collaboration with Balfour Beatty Power Networks Ltd, questionnaires are distributed to residents before and after their street lighting is changed. A test rig is being designed to enable investigation of the visual detection lobe under different lighting conditions – this will identify effects on obstacle detection.